A previous post dealt with poets and artists who were Touched With Fire and created unusually beautiful works of art. Their poems and paintings were thought to be fueled by madness rather than a uniquely creative gift, possibly combined with a type of manic-depression. Here is a different twist on another kind of perceived abnormality. This poem’s title, Monet Refuses the Operation, leads the reader to believe that Oscar-Claude Monet, founder of French Impressionism, was in need of an eye operation because of the way he painted. But Nobel laureate Lisel Mueller gives us a different take on what may have been clinically diagnosed as failing eyesight due to cataracts, for the growth of a more profound spiritual vision—a ripened appreciation of nature, and a deeper more unified understanding of life. 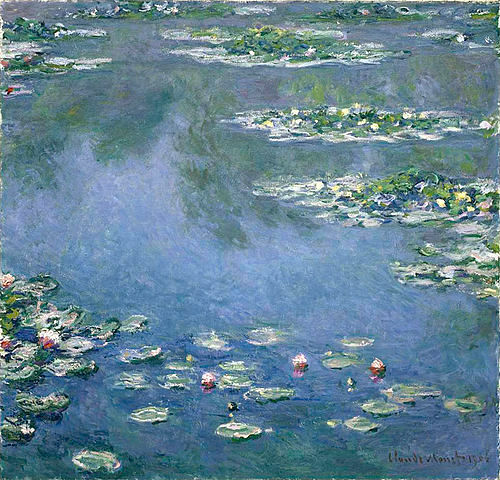 Later in life, Monet had discovered a different way of seeing and created a new way of painting. Another poet, William Stafford, wrote about youth and the mature artist in You and Art. The poem describes, in his own unique way, this spiritual transformation that takes place later in life. The ending of another poem by William Stafford reminds me of an expansion to infinity and the “blue vapor without end” in Something That Happens Right Now. Here is a collection of some of Monet’s paintings. Enjoy another beautiful poem by Lisel Mueller in this post: Lisel Mueller’s poetry offers us Hope.